Pilates & Movement develops core strength and flexibility, as well as improving body awareness, posture, coordination and balance. It is a mindful user-friendly way to get stronger without getting hurt. 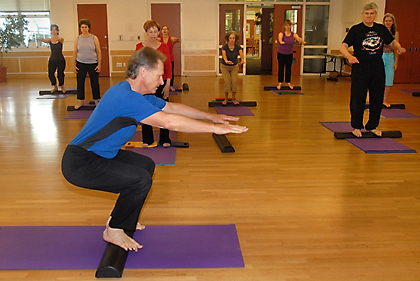 Develop a deeper knowledge of Pilates and learn how to practice in a safer more effective way. Experience in Pilates, Yoga, or other movement discipline required (or permission from instructor). We use a full skeleton and other anatomical models, as well as books as reference materials. It is an active movement class that will challenge your body and your mind. CHECK: Send check pay to Ernie Adams, 1164 Solano Ave., Box 164, Albany CA 94706. REGISTER: Online (www.albanyca.org), or at center. Call for Information: 510-524-9283. *Missed classes be made up at my Tuesday classes in El Cerrito for a $5 fee.